When Gracie was a baby I was lucky enough to win an amber teething necklace in a competition. Up until then I couldn't quite believe that by simply wearing a piece of jewellery with no chewing involved could ease symptoms of teething. Once we started using it we had no problems whatsoever with teething we just noticed the slightly red cheeks and that was the only noticeable clue that she had teeth coming through. 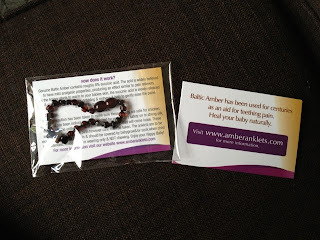 I was recently sent an amber teething anklet from Amber Anklets for Zach to review. Of course this time round I already had the faith in the anklet to help him. It couldn't have come at a better time as Zach got his first tooth on Fathers Day and has been teething pretty bad ever since. He seems to be suffering more than Gracie ever did and he currently has his top front two teeth coming through and they look huge and sore bless him. He doesn't seem to be too bothered though apart from the chomping of everything in sight! He has had no high temperatures and a small amount of crying. I think we have had it easy so far with teething and I definitely think it is thanks to the amber teething jewellery. The anklet is not only made from natural amber which is known for its healing abilities but it is a safe way for him to wear jewellery all through the day with no worries of him hurting himself. Of course with necklaces you have to be aware of them pulling or catching it but the anklet if you are worried can be kept covered with a sock to keep it in place. They say the darker the amber the more powerful it's healing abilities so we chose the darkest colour of course which is Dark Cherry but it is also available in dark honey, lemon, light honey, multicolour and rainbow. The anklets are available to buy at www.amberanklets.com for £9.99. If you are worried about the choking hazards, you need not be as each bead has been individually hand knotted onto strong silk, meaning in the unlikely event of it breaking, only one bead will come loose. 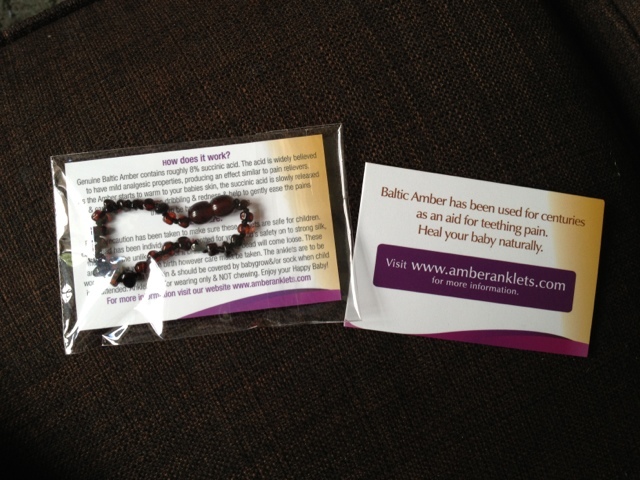 I would definitely recommend this amber anklet for parents with teething babies. As well as being given one to review we have kindly been given two to give away so two lucky winners will receive one each. If you are not lucky enough to win or just want to buy one you can get 10% off with code 'new10' and delivery is free as standard. Open to UK only. The competition will end 24/09/2013 at 12am. The blog owner will choose the winner through the rafflecopter form (which uses random.org) The winner will be notified by email and displayed on the widget. The winner will then have 10 days to claim their prize. If the winner hasn't claimed their prize after 10 days another winner will be drawn. No alternative prize will be offered. Two winners will receive one dark cherry anklet each. Amber necklace, Nelsons Teetha and Mummy-milk! calpol and a facecloth with cold water! We use a herbal teething powder. Bibs and teethers in the fridge! Teething gel and teething rings at the moment, though still no teeth yet. A good crunchy cold apple! Bonjela and calpol are very good but I would much rather use natural things like these bracelets! would be interested to try it!